A pilot for a reboot has a unique task. There is the assumption that most viewers are already familiar with the property, and there is going to be a niche audience that is much more than familiar. The diehard fans are poised to critique every detail. So what makes a pilot for a reboot successful? There are two ends of the spectrum when it comes to approach. At one end, the pilot could say to the viewer, “Forget everything you knew about previous incarnations of this property.” The story basically starts over, in the present day. V is an example. Viewers need not have a clue about the 1980s mini-series and following TV series. In fact, they might be better not having seen the original and having the whole lizard reveal spoiled for them. At the other end, a pilot can dive in to a storyline already in progress. Terminator: The Sarah Connor Chronicles does this really well. We last saw Sarah and son John in 1991, when John was about 12 years old, so the show now has to bring us up to 2008, when it debuted. The pilot opens in 1999 and, staying faithful to the timeline set forth by the movies, John is introduced as a teenager. We learn in the opening scene Sarah is haunted by the same nightmares of worldwide destruction that we remember. 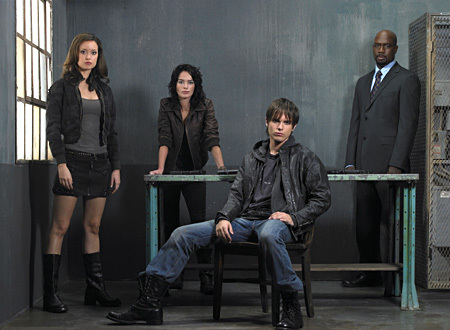 In order to get us to the right year, the writers have the new Terminator, played by Summer Glau, bring the characters forward in time to 2008. If you’re actually new to this, it’s likely you just won’t care about these characters. It’s also likely you’ve been living under a rock. On the lighter side, 90210 stuck with the timeline set forth by its predecessor, Beverly Hills 90210. The newer show had some fun updating viewers on the lives of characters we once knew, even bringing some of them back so we wouldn’t always be stuck remembering them with hideous hairstyles. According to Ramon Rodriguez, who has been cast as Bosley, the new Charlie’s Angels is set to go in a new direction. However, the movies already took a big step away from the camp of the original series. So what, exactly, are they moving away from? And do we care? Does a show’s pedigree matter, or only that it’s good? There’s still a long way to go with all of the aforementioned reboots, and no telling how much restructuring they will go through on their way to the airwaves—if they even make it that far. Then will each one be a 90210? Or a Melrose Place? Once they debut, fans will no doubt have their expectations well in place. This entry was posted in 1970s, 1980s, 1990s, 2000s, 2010s, About Pilots and tagged 90210, beverly hills, bryan fuller, charlie's angels, dallas, john connor, melrose place, miami vice, munsters, pilots, reboot, remake, sarah connor chronicles, summer glau, terminator, wonder woman by meekthegeek. Bookmark the permalink.